Are you a movie and music lover who wants to get the most out of your home entertainment? The Yamaha AVENTAGE RX-A1080 will bring you all of the excitement you have been missing. The 7.2-channel AV Receiver has all of the features you want in a home theatre receiver. Yamaha RX-A1080 Aventage is a 7.2-channel AV receiver with enhanced sound quality, high power and exceptional functionality. It offers the ability to add wireless surround speaker/s via MusicCast 20 or MusicCast 50 alongside Dolby Atmos and DTS:X support. WIth the Yamaha RX-A1080 you will hear music exactly as the artist intended -- clear and powerful. This receiver can play a variety of high-resolution audio formats from a USB storage device or your computer over WiFi. From the sound of a singer’s breaths between verses to the tap of a drum stick on a hi-hat, hi-res audio lets you hear every detail. The Yamaha RX-A1080 is designed to help you get more from all of your home audio. This AV receiver features component video inputs, composite video inputs, digital audio inputs, optical and coaxial, analog stereo inputs and a phono input for connecting a turntable. It also features enough. It even has enough HDMI output for you to watch two separate video sources at the same time. This special 'AV Setup Guide' app assists you with cable connections between the AV receiver and source devices. Additionally, it guides you through various settings such as speaker connections, TV and source device connections and power amplifier assignments. When ECO Mode is turned on it can reduce power consumption by about 20 percent, thanks to an advanced energy saving design. MusicCast Wireless Speakers allow you to enjoy the sounds of your RX-A1080 throughout your entire home. 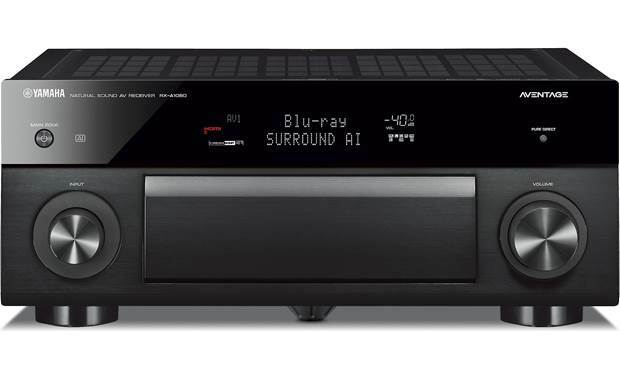 This AV receiver wirelessly connects to MusicCast speakers so you can stream music from your mobile devices, internet radio, and streaming services and TV. The free MusicCast Controller app lets you control the audio right from your smartphone or tablet. Whether you live in a cavernous mansion or cozy apartment you can rest easy knowing you won’t need a degree in acoustic engineering to get started with your RX-A1080. This Yamaha receiver features YPAO Sound Optimization. This technology analyzes your room and automatically makes acoustic adjustments to compensate for factors that impact your sound. The result is crystal clear audio performance no matter where you use your Yamaha receiver. The AVENTAGE RX-A1080’s beauty isn’t skin deep. Sure it is stylish, but it's designed to enhance your listening experience. A SABRE ES9007S Premier Audio DAC receiver produces professional quality digital audio. Anti-Resonance Technology reduce vibrations so you won’t hear any distracting noise when you crank the volume. The aluminum front panel shields the internal circuitry from external noise and electronic radiation. Stream Spotify, Pandora, Tidal, Apple Music or just about any other app with audio using the RX-A1080's built-in Bluetooth or Wi-Fi. Sit back and listen as Yamaha’s Compressed Music Enhancer ensures all of your streaming files are clear and powerful. You have never heard music sound like this. S&I Verdict - The Yamaha AVENTAGE RX-A1080 brings out the best in your movies and music, delivering crystal clear sound with rich detail. The RX-A1080 is a true home audio powerhouse.